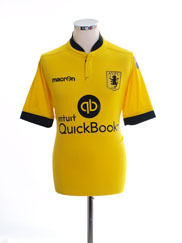 Aston Villa football/soccer T-shirts & jerseys for sale which you can buy now online right now! Details: Away shirt as worn when Aston Villa were relegated from the Premier League, finishing bottom of the table with just 17 points, 22 points away from safety. Also worn when Aston Villa were knocked out in the fourth round of both the FA and League Cup, losing against Manchester City and Southampton in respective competitions.